The inherent problem with compounded sterile products (CSPs) is that the efficacy of IV medication administration hinges on the integrity of dose preparation and labeling in the pharmacy. If an item is compounded incorrectly in the pharmacy, no amount of verification at the bedside will alter that. Other than looking at an IV bag or syringe to ensure that no gross particulate matter is present, without chemical analysis it is impossible to verify the contents. Occasionally a color change will acknowledge the addition of the correct additive – yellow multivitamins, red doxorubicin, and so on – but even then, the correct amount (volume/dosage) cannot be verified. 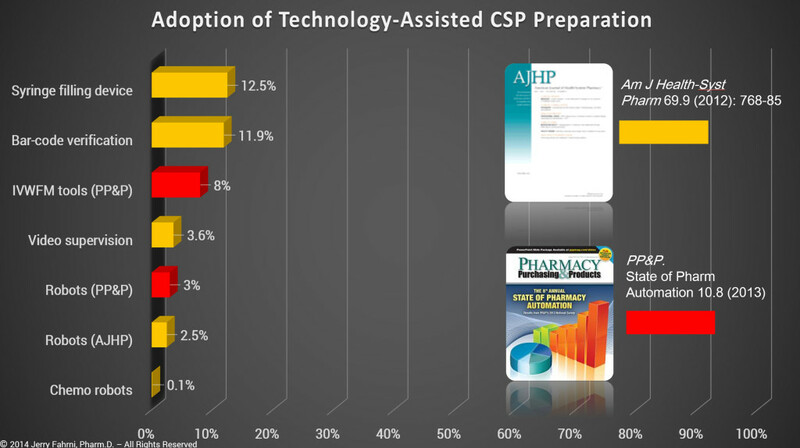 Both USP <797> and ASHP Guidelines make it clear that the responsibility for ensuring accurate CSP preparation resides solely with the pharmacy. But how does one accomplish such a responsibility? The answer is not simple. Diligence, improved workflow, proper procedures, checklists, etc. all have a role in improving the sterile compounding process. However, all of these rely on fallible human interaction. Humans make mistakes, and there’s no way around that. Technology, when used properly can be utilized to ensure that CSPs contain both the proper ingredients and correct amounts. On the upside, interest in i.v. room technology has been building for the past couple of years. Pharmacy has been slow to respond to the need, but at least there appears to be progress. I was involved in several conversations around pharmacy i.v. room technology and CSP production at ASHP Midyear back in December. However, few were discussing the need for bar-code scanning during the medication preparation process. It’s one of those things that seems to get easily overlooked when discussing technology-assisted CSP preparation; perhaps because bar-code scanning remains a very manual process. Even so, I believe that the use of bar-code scanning in the i.v. room during CSP production remains one of our most valuable weapons in the fight against errors. It will be interesting to see how this technology is used over the next two or three years. potentially RFID, but existing RFID technologies require that pharmacies attach RFID tags to existing drug packages. This is often accomplished by pairing the RFID tag with the medication via the bar code, once again boiling the accuracy down to a bar code scan. I’ve had people argue that gravimetrics is not accurate when several items have similar, or the same specific gravity. This is true in theory, but not in practice. If given the same volume of two liquids with similar specific gravities and asked to identify them by weight alone, one would fail. However, it would be relatively simple to verify the volume by weight of a known drug, i.e. bar code scan the liquid for identification first, then weigh it. No system is 100% if the end user refuses to follow the proper procedure. Based on my personal experience, and data collected in the past 18 months, the numbers presented by ASHP and PP&P are overly optimistic. I believe that data presented in the surveys is skewed by several variables. Wrong drug put in IV bag led to fatal Bend hospital error. 2015. Available at: http://www.ktvz.com/news/st-charles-to-issue-results-of-fatal-drugerror-probe/30115104. Accessed January 4, 2015. Report: Limited FDA Survey of Compounded Drug Products. 2015. Available at: http://www.fda.gov/Drugs/GuidanceComplianceRegulatoryInformation/PharmacyCompounding/ucm155725.htm. Accessed January 11, 2014. Trissel LA. “Compounding our problems–again.” Am J Health-Syst Pharm. 1 Mar. 2003: 432. Selenic D, Dodson DR, Jensen B et al. “Enterobacter cloacae bloodstream infections in pediatric patients traced to a hospital pharmacy.” Am J Health-Syst Pharm. 2003; 60:1440–6. Niedowski E, Bor J. State to probe Hopkins death: 2-year-old cancer patient died after receiving improper IV mixture. December 20, 2003. Baltimore Sun, Baltimore, MD. Solomon SL, Khabbaz RF, Parker RH, et al. “An outbreak of Candida parapsilosis bloodstream infections in patients receiving parenteral nutrition.” J Infect Dis 1984; 149:98–102. Hughes CF, Grant AF, Leckie BD, et al. “Cardioplegia solution: A contamination crisis.” J Thorac Cardiovasc Surg 1986; 91:296–302. Associated Press. Pittsburgh woman loses eye to tainted drug; 12 hurt. Baltimore Sun. November 9, 1990:3A. Dugleaux G, Coutour XL, Hecquard C, et al. “Septicemia caused by contaminated parenteral nutrition pouches: The refrigerator as an unusual cause.” J Parenter Enteral Nutr 1991; 15:474–475. Perrin J. “Unsafe activities of compounding pharmacists.” Am J Health-Syst Pharm 1995;52:2827–2828. American Society of Health-System Pharmacists. ASHP Guidelines on Compounding Sterile Preparations. Am J Health-Syst Pharm. 2014; 71:145–66. Cohen M, Smetzer J. ISMP Medication Error Report Analysis – Leucovorin-Levoleucovorin Mix-Up; Two Error-Reduction Principles, One Change; Syringe Pull-Back Method of Verifying IV Admixtures Is Unreliable; Fleet Enema Saline Is Not Just Saline; ISMP Processes Health IT Error Reports.Hospital Pharmacy. 2013;48(10):803-806. doi:10.1310/hpj4810-803. Nice justification. Better than the misguided, boondoggle of BCMA. I agree 100% with your conclusion that barcode scanning in the IV room during CSP production remains one of our most valuable weapons in the fight against errors. Barcode scanning of the IV admixture components (e.g., vials, bags) and the barcode on the patient-specific IV label is a relatively simple process that can certainly catch most of the “wrong product” errors that can occur during the IV additive process. It is very analogous to BCMA and others have coined the term BCMP (barcode medication preparation) to describe it. One might ask why this simple approach is not being used, while at the same time pharmacies have been exploring more complex imaging/gravimetric solutions that also include an up-front barcode scanning component. I think a partial answer to this is that there is “no money” to be made selling a simple barcode scanning solution, so vendors have pursued the more complex solutions. I am aware of at least two EHR vendors (i.e., MEDITECH and Epic) that offer barcode scanning solutions for use in the central pharmacy to check any type of “compounded” preparation, including IV additives. Interestingly, these capabilities are offered without any addition charge to hospitals that have implemented the vendors’ BCMA capability. MEDITECH calls their pharmacy barcode checking feature, which has been available for at least eight years, Compound Verification. Epic calls their barcode scanning solution, Dispense Prep and it has been available since 2012. I know of one hospital who has been using this approach for almost 8 years and they would not do it any other way. Granted, BCMP still requires a traditional pharmacist check of the preparation either in the IV room or outside the IV room. The principal advantage of the new IVWF solutions is that they allow a pharmacist to check the work of technicians remotely (i.e., by viewing images of “the work”) from outside the IV room. The question might be asked, “is the checking done by examination of images remotely as good as a manual process from a quality perspective?” It appears to me that you have to “look harder” at the images to make sure everything is appropriate than you do performing the same step manually and I worry that pharmacists will develop “image fatigue” (similar to drug interaction alert fatigue) resulting in a new type of checking error; an unintended consequences of the new technology. I, like you, will enjoy watching to see how the new IVWF technology is used over the next two or three years. Interesting that I haven’t come across a single facility using the bar-code scanning solution that is native to the EHR/Pharmacy system. One would think it would be more common. I only learned about it myself in mid-2014, and it happened completely by accident. Your comments on using images to verify orders rings true. It does indeed require a little more effort to verify the volume of a syringe from looking at an image. However, it’s certainly a step up from the pull-back method. I feel like we’re making progress, albeit slow. Using images to verify the compounding process doesn’t fill like the final solution to me. Rather it seems like a bridge from what we were doing to where we’re heading. Someone will figure it out. Whether or not that happens during my career is another matter entirely. This is a very great post. I like what you guys are up to. BTW, I found another recent post related to bar code medication administration pictures: http://www.dynamsoft.com/blog/barcode-reader/barcode-technology-in-medication-administration-systems/ . It talks about the consideration when implementing barcode medication administration. May I know your thoughts about it? The article you reference doesn’t really say all that much about BCMA. It’s an interesting piece, but I didn’t find much use.